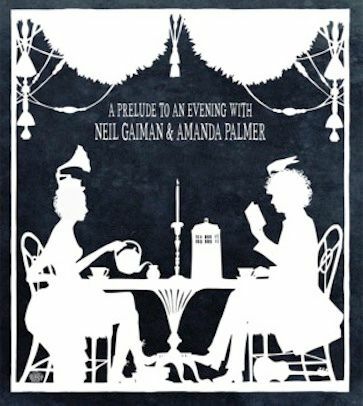 Neil Gaiman's Journal: Back from the Blog Dead. Back from the Blog Dead. My whole tour is done, and I am tired and happy. I just saw a beautiful, moving play called THE EVENTS at the Young Vic, starring Neve McIntosh and Rudi Dharmalingam (and a choir). It was about empathy and violence, and I highly recommend it. Tomorrow, I will tell you about the last week in the UK, about FORTUNATELY THE MILK, about the astonishing show last night at Westminster Central Hall, about Breakfast TV and the Reading Agency Speech. 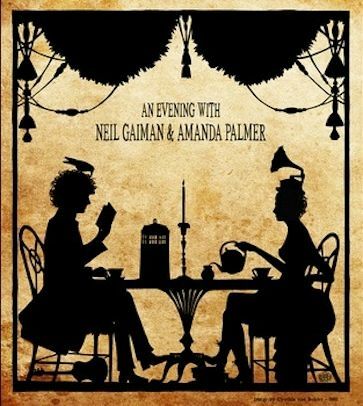 neil and i did a kickstarter about two years go, to sell pre-orders/pay for a tour recording of our “evening with neil gaiman and amanda palmer” tour up the west coast in fall 2011.
the kickstarter raised over $100k with about 3k backers, and we took two engineers on the road with us (many of you know jaron luksa, my veteran sound guys…he was one of them, and he brought his pal ken). they recorded every show in HIGH FIDELITY and then neil and i spent the rest of the fall and winter picking out our favorite tracks from what was probably about twenty+ hours of recordings. (that was slightly agonizing). that tour was pretty magical, and lots of unexpected things happened…including a fan of ours dying at occupy vancouver a few days before we got to town. one of the songs is dedicated to her. neil combatted his stage fright. i tried to work on my stage-control issues. we both learned to give each other space. 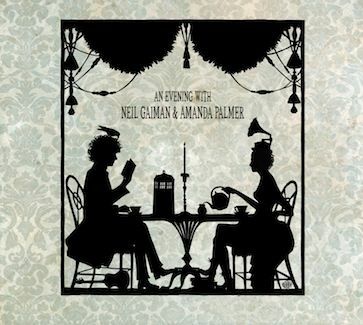 we took questions every night from the audience and surprised ourselves, and each other, with some of the answers (so now there’s a “best of ‘ask neil and amanda’” on the record). mostly, we watched our fanbases merge, like a giant family wedding, and were relieved that no brawls broke out. we asked our friend cynthia von buhler to make the art (it’s a hand-made cut-out, and gorgeous) and we packaged the whole she-bang onto 3 CDs. and then eventually everybody got their discs in the mail and everybody was pretty happy, so yay. then we didn’t do anything…..we didn’t release it online to the public or put it on sale in stores….no iTunes, no bandcamp, no topspin, no nothin. we wanted the kickstarter backers to enjoy it and i was already in the full throes of preparing “Theatre is Evil”. so we waited. NOW – or, well, next month – is the moment we’ve picked (ta da) to release it to the general public…ALMOST the same tracklisting, but all-new packaging (so that the kickstarter edition stays super-special). we also made VINYL. the whole album would have taken up (gulp) 6 sides, so we pared our favorites down even further and condensed everything onto two records. we also thought long and hard about what kind of merch to offer along with the album – since we know you love good merch, and christmas is coming. SO, your best bet is to order NOW before halloween night…all orders placed during this period will definitely arrive in time for the holidays. i deliberately chose songs for this tour that i HADN’T ever released but was aching to…songs like “dear old house”, “gaga, palmer, madonna”, “i want you but i don’t need you”, and “look mummy no hands” have been huge live favorites but didn’t quite fit on “Theatre is Evil” so they were burning a hole in my pocket. i consider these the official versions. if you *ARE* one of the 3k kickstarter backers, WE THANK YOU SO MUCH for making this project possible. we wouldn’t have done it without you. and if you want to help the cause and push the album forward, write some thoughts/reviews about it all (you’ve had it for a while, you’re entitled) down in the comments (or anywhere on the web) to help us, please. 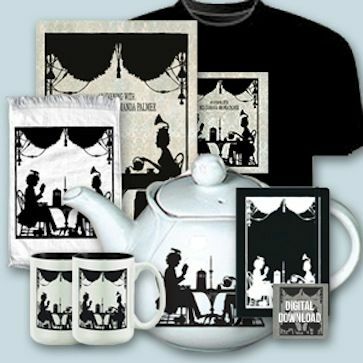 and include the pre-order link – bit.ly/EveningWithPreOrder – anywhere you are talking up the record. AGAIN, ORDER BY NOVEMBER 1st FOR THE XMAS DEADLINE!!!!!!!!! if you have any questions not covered here, eric’s being a dear and helping out HERE on the forum. also, do us a solid: ONCE YOU ORDER, share the joy & link, spread the word! please? make friends jealous of velvet posters! BONUS for OZ/NZ: @POSstore has 1 of 10 LIMITED EDT 7″ vinyl that you have a chance at winning…more info at bit.ly/AFP7inchOH!! and ONE MORE LAST THING!! NEW YORK (and surrounding areas): to celebrate the release of the record, we’ve added a (second) EVENING WITH NEIL & ME show on FRIDAY NOVEMBER 22nd at town hall (since the first night sold out super-quick). there ARE still tickets available, but they’re moving fast. you can grab yours HERE. it’s gonna be a fun couple o’ nights. 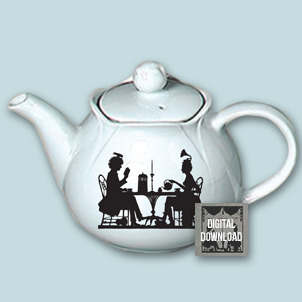 And just adding that the ordering window on the teapots is just about to close, so if you want a teapot, order now at http://bit.ly/AnEveningWithPresale.